Statistics from El Salvador's Ministry of Education show that the majority of students in El Salvador who complete sixth grade will not complete high school (bachillerato). As reported in La Presna Grafica, only 42.6% of students who were in sixth grade in 2011 were still in school in 2016. The national class of approximately 135 thousand sixth graders had dropped to 58 thousand still in school. This drop out rate creates significant challenges for the students to successfully earn a future living and for the country to have an educated work force which can produce economic growth. El Salvador has one of the highest percentages of its native born population currently living in the United States. Estimates vary, but if there are approximately 2 million people originally born in El Salvador living in the US, then approximately 1 in 4 people alive who were born in El Salvador live in the US. As a result, the actions of new US president Donald Trump on immigration and border security have major implications for El Salvador. Although media attention has focused on the impact of Trump's executive orders from January 25 and January 27 on Muslim immigrants and refugees, the effects of the orders are more far-ranging and will have immediate impacts on Salvadoran migration. There is currently a significant flow of children and families from El Salvador towards the US, seeking asylum as they flee violence and gangs in the country. Nearly 14,000 Salvadoran children and family members were detained at the US border in October and November 2016 alone. Driving in north central El Salvador this weekend as I have often done, I was struck by a changing landscape. In many more locations than before, sugar cane was being grown and harvested. Where once corn stalks had stood or cows were grazing, the tall stalks of of sugar cane dominated. 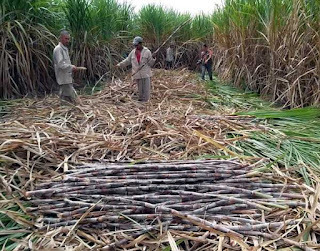 This is the time of year of the sugar cane harvest. The smoke of cane fields being burned can be seen every day. We live on the southern side of the capital city of San Salvador, and the black ash regularly floats through open windows and doors. Massive cane trucks fills the highways carrying the harvested cane stalks to the country's sugar mills. One reason El Salvador is so worried about president Trump's actions on immigration is the country's dependence on family remittances from relatives in the US. During 2016, those remittances hit an all time record high according to El Salvador's central bank: Remittances to El Salvador jumped by 7.2 percent in 2016 compared to the same period a year earlier, reaching the highest level in the country's history and marking the biggest increase in a decade, El Salvador's central bank reported Monday. Remittances, which mostly come from the United States and underpin the impoverished Central American country's economy, totaled $4.58 billion in 2016. "The accumulated [amount] between January and December 2016 constitutes the highest amount in the history of remittances received in El Salvador and the highest growth rate in the last 10 years," the bank said in a statement. The remittances equal 17.1% of El Salvador's total economy. Every year end the University of Central America Institute for Public Opinion polls Salvadorans on a variety of topics. One of the questions asked each year is which institutions Salvadorans have "much confidence" in. Taking the results from the most recent poll at year end 2016 and the results from 10 years earlier, I have displayed the changes over a decade below. In 2016, the most trusted institutions are now the evangelical churches, trusted by 33.4%, a number largely unchanged since 2006. The least trusted, with only 3.5% of Salvadorans expressing much confidence, are the political parties, followed closely by the National Assembly (5%) and Businesses (5.9%). Interestingly, the entities which had the largest increases in confidence from 2006-16 were those involved in security: the National Civilian Police (18.4 to 25.8%), the Armed Forces (23.8 to 29.3%), and the Attorney General (7.3 to 12.9%). On the day the country was celebrating the 25th anniversary of the 1992 Peace Accords, the Constitutional Chamber of El Salvador’s Supreme Court issued an important decision, ruling against the country's armed forces in a recent case of forced disappearances. The events in the case took place in February 2014 and arose from the military's role in patrolling El Salvador in support of the police in battling the country's gangs. A group of youth were talking in front of their houses in the municipality of Armenia. Six or seven soldiers on patrol approached the group and at gunpoint forced five of the boys to accompany the soldiers. They were taken from a zone controlled by the Barrio 18 gang to a zone controlled by MS-13. Two of the youth were released, and they went off to wait for their three remaining friends. Their friends never appeared, and to this date have never been seen again. Today is the 25th anniversary of the signing of the peace accords which brought an end to El Salvador’s twelve year long civil war. The warring parties became political parties. The armed conflict was brought to an end, and a series of political reforms was put in place. The anniversary is being celebrated with official events today and throughout the year. “Peace is not the absence of war” – this has been the tag-line in a set of announcements on the radio station of the University of Central America in San Salvador. Many Salvadorans do not believe that the Peace Accords brought peace, even though they did end the war. Certainly El Salvador’s position as the country with the highest “peace time” homicide rate, suggests that there is much yet to be achieved. Still, El Salvador has been transformed for the better in several ways following the end of the civil war. 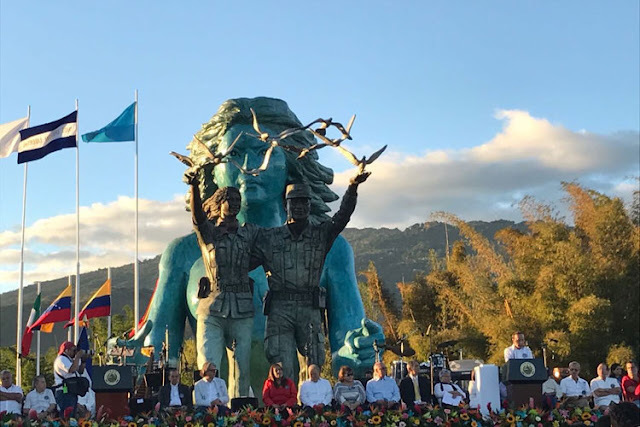 On the eve of the 25th anniversary of the 1992 Peace Accords in El Salvador which ended the country's civil war, the government unveiled a new monument to reconciliation. This week the UCA Institute of Public Opinion released its annual year end poll asking Salvadorans their opinions on a variety of subjects. Over my next few blog posts, we'll look at some of the results in the poll. Perhaps the saddest part of the poll was contained in the opening paragraphs of bulletin announcing the poll results. 40.3% of the respondents said they would like to migrate from the country in the next year. According to the UCA, this is the highest percentage of people wanting to leave over the past decade of asking the question. In addition, 17.2% of the respondents said that some person in their extended family had to flee the country during 2016 as a result of some threat or act of violence. 71.2% of those polled believed that migration out of the country had increased in the past 12 months. In an interview with the online periodical El Faro, spokesmen for the gang Mara Salvatrucha (MS-13), described a proposal for sitting down at a table for dialogue with the government. For the first time, the gang leaders indicated that they would be willing to put the dissolution of the gang on the bargaining table. The full article from El Faro has been translated into English and is available at the InsightCrime website here. Here is my annual round-up of the top ten stories from the previous year in El Salvador. "Exceptional measures" to combat gang violence. In March 2016, the government announced that it would be deploying exceptional measures in its fight against the country's gangs. The measures included transferring gang leaders to high security prison and placing them in solitary confinement, increasing the military presence on the streets including in San Salvador's historic center, and an overall level of increased hard-line tactics. In response to attacks on security forces, the government announced "Plan Nemesis" in November, to increase further the hard-line tactics directed towards the gangs. But by the end of the year, there was not a great deal of evidence the measures were working. While the homicide rate was down from the bloody high in 2015, 2016 would still go down as the second bloodiest year since the year 2000. The gang violence which continues to bedevil El Salvador has forced a suspension to archaeological investigations at Joya De Ceren. According to an article published in El Faro, the archaeological team from the University of Colorado, which has been working at the site for almost 40 years, retired from the country in 2016. El Faro published an article from Dr. Payton Sheets, the original discover of the ancient Mayan village now classified as a World Heritage Site.